Amazon Echo is a smart speaker that is designed to be an entertainment device and information hub for your home. The voice-activated smart home speaker is undeniably futuristic and also practical. It is one of the best voice-controlled devices in the market right now. It undeniably makes your home smarter. 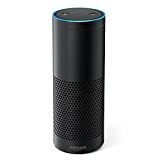 Amazon Echo is a minimalist looking black cylinder, about 9 inches tall and 3 inches in diameter, with a decent speaker. It also has a bunch of noise-canceling listening microphones and a few physical controls. The device looks stunning with LED light ring at the lid. One of the primary Echo features is the responsive assistant called Alexa. It works in a fashion similar to Siri on iPhones and iPads. The key is Alexa. She’s helpful, she’s capable and she’s really good at understanding what you are asking her. Echo serves as a personal assistant, letting you tap into news, weather, information, music, alarms and other services. Another exciting feature is the ability to connect Echo to home devices, such as smart lights and outlets like the Phillips Hue, WeMo and Wink. Just ask Alexa to turn the lights on and off, and they will turn on and off. This is a wow factor. Alexa stands out from the rest because she isn’t just a feature on a device. She lives in your living room or kitchen, so everyone in the family can use her, hands-free. As for audio quality, the Echo features a dual downward-firing speaker that promise 360 degrees of “immersive sound.” Echo plays music from different music sources like Pandora, Amazon Prime Music and I Heart Radio. Amazon Echo does a fine job of filling the room with sound, especially with crisp speech playback. It supports both WiFi (for Internet sources) and Bluetooth (for mobile device sources). If you’re a gamer, there are skills for games such as Minecraft and Destiny that’ll turn Alexa into a helpful sidekick. If you’re a musician, there are skills that let you use the Echo as a metronome or guitar tuner. The only downside is that you can’t sync Alexa with smart TVs yet. You can own an Amazon Echo if you are willing to spare 180 bucks to make your home smart.